Have you ever dreamt of laying inside a bubble and watching the stars? The option is available in the Indian oceans grooviest getaway, Finolhu Maldives. 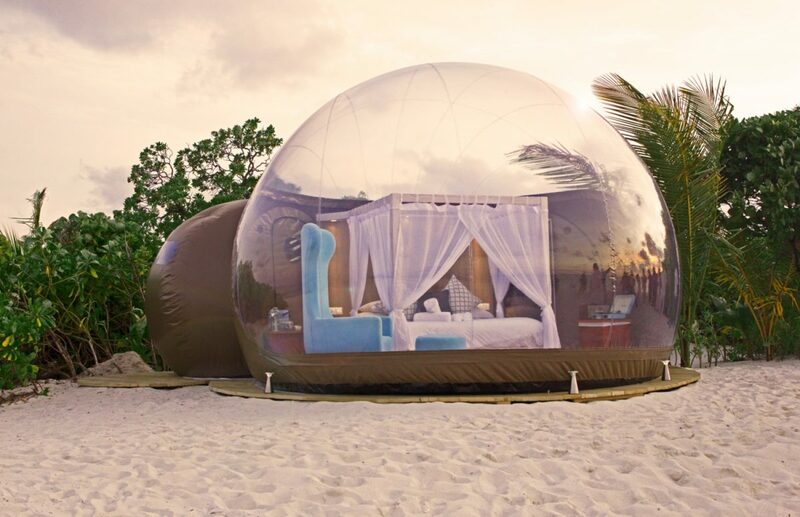 This bubble tent is located on a secluded spot on Finolhu’s famous 1.5km sandbar in the Baa Atoll. The Beach bubble is inflatable and transparent. This is an idyllic choice for those who enjoy the nature, and experience it with comfort. The Interior is designed with custom fitted wooden flooring and fine furnishings. Additionally, the bubble has an attached separate bubble bathroom and shower. The bubble comes with high-speed WiFi and air conditioning. Furthermore, Finolhu Maldives has branded the bubble experience as “Dream Eclipse”. A night in this Bubble will cost USD 600++ per couple. Unwind in your bubble gazing at the endless stars, or maybe make it a romantic getaway with your significant other. “Dream Eclipse” package lets you stay in for one night and gaze at the stars to enjoy the sunrise. The beach bubble is a short walk away from the famed Fish & Crab Shack. This getaway experience includes barbecue by the beach and a waterside breakfast. Imagine you and your loved one, completely alone for one amazing and magical night under the stars. This could be one of the most exciting adventures to add to your bucket list!